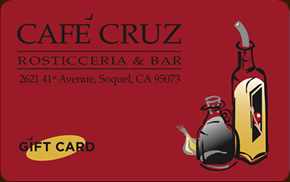 Cafe Cruz believes that using healthy, high quality ingredients translates into the best tasting food. We use the freshest local produce (organic when possible), freshly caught fish from sustainable sources, fresh natural California poultry & pork, and Harris Ranch Beef (naturally raised in California), complemented by our other top of the line ingredients. We also incorporate a variety of locally made products into our menu, including Laura Chenel's goat cheese from Sonoma County, bacon locally cured and smoked in San Jose, bread baked daily by Gayle's Bakery in Capitola, organic coffees blended by The Santa Cruz Coffee Roasting Co, Polar Bear Ice Cream (a local favorite), our decadant Mile High Chocolate Cake from Black China Bakery, and eggs from Glaum Ranch in Aptos. In addition, many of our excellent wines are grown locally in the Santa Cruz Mountains. The Santa Cruz Mountain region has earned a reputation for producing high-quality, world class wines at affordable prices. Our guests enjoy wines from outstanding local wineries such as Soquel Vineyards, Beauregard, Storrs Christie Vineyard, Martin Ranch, Hunter Hill, Kathryn Kennedy, David Bruce, Clos la Chance, and Heart O'the Mountain.